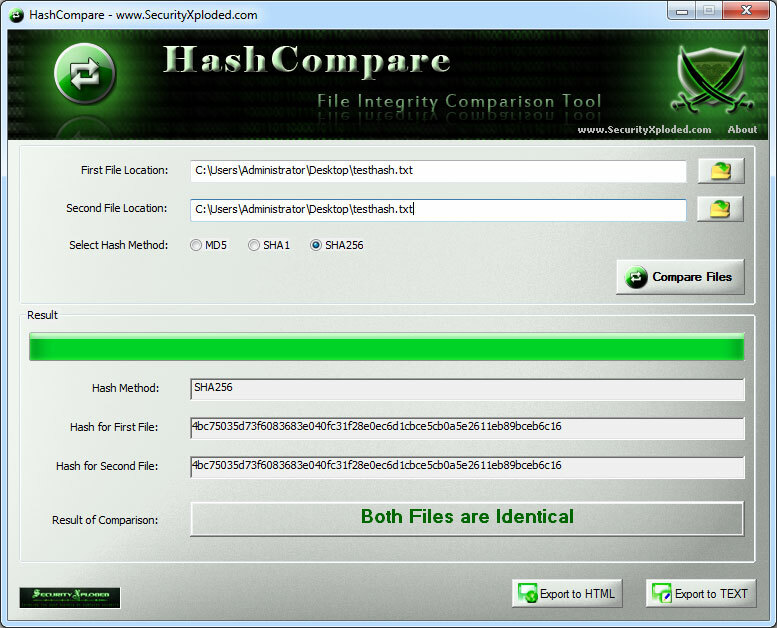 Hash Compare is the FREE File Hash comparison tool. It performs Hash based Integrity Comparison using any of the the popular hash algorthms such as MD5, SHA1 or SHA256. To make the task easier and quicker, it also supports the 'File Drag & Drop' feature. That means you can just drag & drop one or both files directly without wasting much time in selecting them. Hash based method is the standard way of verifying the integrity of files. Often it is used to check the Integrity of Download Files downloaded from the internet. It is also used to compare two versions of the same file. In such cases HashCompare comes handy in performing quick comparison of the files. Here are some of the features of HashCompare * Performs file integrity comparison using popular Hash algorithms such as MD5, SHA1 & SHA256. * 'Drag & Drop' feature to quickly drag one or both files. * Save the file comparison report to HTML/XML/TEXT file * Displays detailed status during the operation. * Simple, easy to use GUI Interface. * Completely Portable Tool which also comes with Installer for local Installation & Uninstallation. HashCompare works on wide range of platforms starting from Windows XP to latest operating system Windows 8. This site does not contain serial number, crack, keygen Hash Compare serial number : serial number is the simplest type of crack. A serial number(cdkey,product key,etc) is register the program as you may already know. a crack or keygen may contain harmful software. If you cannot find the exact version you want, just give it a try. for more information read .nfo/.txt/.diz file include in zipped file.